CHICAGO – Writer/director Ramin Bahrani is interested not in agendas, special effects, or broad statements. He makes films about characters, including the widely acclaimed “Chop Shop,” “Man Push Cart,” and “Goodbye Solo.” For his latest drama, “At Any Price,” Bahrani expands his canvas, using more household names in his effort to tell a story of the heartland and the corruption and greed that can infiltrate even the most seemingly pure aspects of American life.It is a film of noble origins with interesting ideas that nonetheless misses its mark due to a narratively unbelievable twist in the final act and another blank performance from Zac Efron. 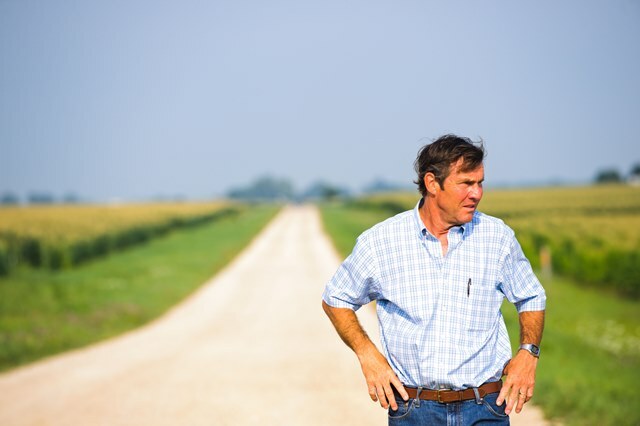 Dennis Quaid nearly makes it worth seeing on his own and I have no doubt that the multi-talented Bahrani can bounce back but this modern farmer’s tale is a melodrama that I simply didn’t buy. Henry Whipple (Quaid) is a good guy who makes some morally questionable decisions right from the first act. In the opening scene, he’s teaching his son Dean (Efron) the art of the deal by trying to buy some farmland at the former owner’s funeral. The natural response is “ewww” but Henry, like so many people, is trying to keep his head above water. He’s facing pressure to keep his grain business the number one in the county while the competition, Jim Johnson (Clancy Brown), seems to be stealing his clients. Read Brian Tallerico’s full review of “At Any Price” in our reviews section. It doesn’t help the Whipple empire that one son, Grant, has basically run as far away from home as possible. They lay out the red carpet for the return of Grant but just get postcards about his latest adventure. It feels like Dean can’t wait to get out either as his career as a race car driver seems to be heating up. He’s even getting some interest from sponsors, has a cool girlfriend named Cadence (Maika Monroe), and can see the horizon beckoning him to leave the heartland. While he grows more distant from his philandering dad (who is sleeping with an assistant played by Heather Graham who is amoral enough to go from father to son), the Whipple world is truly shattered by two events – the revelation that Henry has been cutting corners in a way that could get them into legal trouble and a major turn that I won’t reveal here. Continue reading for Brian Tallerico’s full “At Any Price” review. “At Any Price” stars Dennis Quaid, Zac Efron, Kim Dickens, Maika Monroe, Clancy Brown, and Heather Graham. It was written and directed by Ramin Bahrani. It opens in Chicago today, May 3, 2013.